Chapters Indigo has a double discount this weekend! Save 15% off on select regularly priced items plus get an extra 15% off when you pay using Visa Checkout! 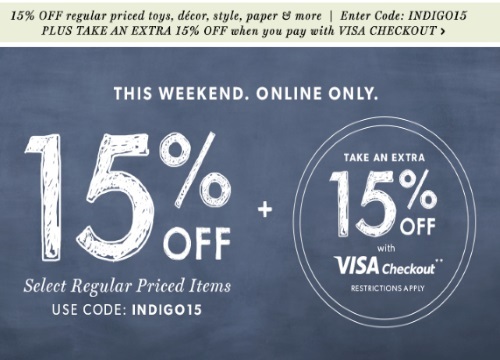 Enter the promo code INDIGO15 to save on regularly priced toys, decor, style, paper and more and then pay with Visa Checkout to get the extra discount too! Offer is valid online only until August 10, 2016.